We finally have a peak at what Warner Bros.’ plans are for a Blu-ray / DVD release of Christopher Nolan’s most recent film, Inception. 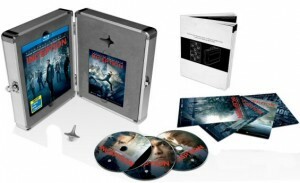 Play.com was the first to make this new limited edition Inception Blu-ray case available for pre-order and Amazon.co.uk quickly followed. Unfortunately for most of us, this is only available in the UK for now. Although, I’m sure that our UK visitors will enjoy this post even if they only make up 9% of our user base. [UPDATE (9/5)]: Jonas notes in the comments that this product is also available to all Europeans. While Amazon.co.uk does ship to anywhere in the world, please remember that these are Region 2 discs. while the Blu-ray disc is region-free, the DVD and digital copy may not be viewable outside Europe. The limited edition Inception Blu-ray pack includes a Dream Machine-like mini briefcase, a spinning top, the PASIV device manual, the two prologue comics (Inception: The Cobol Job and Inception: The Big Under), Triple Play Edition (Blu-ray, DVD, and a Digital Copy), and a photo gallery. Along with this limited edition Blu-ray case, the Inception Blu-ray (Triple Play Edition) and DVD are now up on Amazon.co.uk. All of these products are available for pre-order now and will arrive at your door on December 6, 2010. # Maximum Movie Mode: Christopher Nolan and Leonardo DiCaprio extract information about the world of Inception and learn about all things you may have missed in the film. Questions, answers, surprises and intrigue are all there for the taking! # Inception: The Cobol Job: Online comic that details how Cobb, Arthur and Nash came to be enlisted by Cobol Engineering to perform an extraction on Saito. # Inception: The Big Under: The story that reveals how Cobb and company get to Saito to put him under for the dream featured in the beginning of the film. # Dream of Consciousness: Taking some of the most fascination and cutting-edge dream research to date on lucid dreaming, leading scientist to make the case that the dream world is not an altered state of consciousness, but a fully functional parallel reality. # ‘Triple Play Edition’ includes the movie on 3 formats: Blu-ray, DVD & Digital Copy!